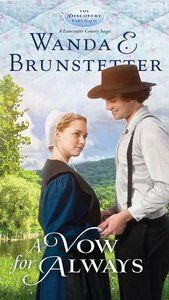 Book 6 of an exclusive 6-consecutive-month release Amish serial novel. New York Times Bestselling author, Wanda E. Brunstetter weaves a compelling love story brilliantly mingled with an unexpected twist. In the conclusion of The Discovery, Luke Stoltzfus's memory completely returns, and he rushes home to Lancaster County. Can Jonah's heart withstand the way Meredith must break it to regain real love with Luke and restore her family? About "A Vow For Always (#06 in The Discovery Series)"